Contracts service manager, Chris Crowe, with one of the new panels. 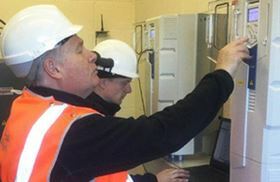 The Coal Authority has announced a major investment in both new pumps and pump controls at its mine water treatment schemes and pumping stations to reduce costs. Coal Authority contracts service manager, Chris Crowe, said that the authority currently spends around £2.4 million each year on electricity, so it has made several changes to cut those costs. Together with several of its partners it has developed a standard specification for motor control centres (MCCs). “MCCs are fundamental to how we move pumped water around our mine water treatment schemes and subsidence pumping stations. They control the pumps and the way we maintain the water levels at our 48 pumping stations,” said Chris Crowe. A review of the authority’s MCCs and pumping assets led to a programme for the replacement and introduction of the new standard MCCs. It has incorporated ABB variable speed drives with intelligent control. The new panels simplify pumping processes and motor control and ensure energy efficiency. A variable speed drive, which controls the output, can reduce energy consumption by as much as 60%. The authority has also looked at premium efficiency pumps which use permanent magnet technology with up to 14% increased efficiency compared to non-synchronous technology.